The moniker after Mick LaSalle’s name says “Chronicle Movie Critic.” Is that little bald man, sitting straight-backed, stiff-necked in his chair, hat in his lap, a picture of LaSalle? The movie page editors headlined his February 29 review: “‘Chicago 10′ Painted As Heroes, But They Come Off as Obnoxious.” Oy vey. Millions murdered in a crazy war on the other side of the world by that infamous President from Texas (Lyndon “How many boys did you kill today?” Johnson, not today’s imposter George W. Bush), thousands and thousands of young draftees thrown into the vortex of slaughter — and Abbie Hoffman is obnoxious? 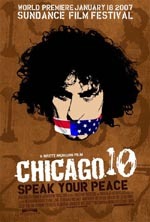 Brett Morgen’s docu-drama, “Chicago 10,” is an edge-of-your-seat sight to behold, full of archival footage straight from the streets of the 1968 Democratic convention in Richard Daly’s police state Chicago. No talking heads here, folks. But critic LaSalle complains about the movie’s “unfortunate use of animation for the trial scenes.” Unfortunate, in my history book, that no cameras recorded the 1969-70 trial of Rennie Davis, Dave Dellinger, John Froines, Tom Hayden, Jerry Rubin, Bobby Seale, Lee Weiner and Abbie — tried for conspiracy to upset the Democrats’ march to war. Mr. LaSalle, this is a movie. It needs visuals. LaSalle wants a “more sober, considered treatment.” I’m old enough to remember all those static drawings from the trial in the daily fishwraps. I particularly remember the drawings of Bobby Seale, chairman of the Black Panther Party, gagged, bound and chained to his chair, in the middle of the trial, for obnoxiously daring to represent himself, and for complaining about the pictures of slave-holders like George Washington hanging in the courtroom. The drawings of Seale were shocking forty years ago. But watching the animated rendition of this racist depredation, of Seale struggling to free himself, of his co-defendants rising from their seats in shocked disbelief, interspersed with scenes of the brutal suppression of free speech in the streets of Chicago during that convention of “democrats,” will have you squirming in YOUR seat, trying to break your own chains — especially in today’s world of water torture, “harsh interrogations” and government-organized kidnaping. Originally, there were eight defendants, known as the Chicago 8. Eventually, the judge severed Seale’s case, and some started calling them the Chicago 7, as if Seale had not only been bound and gagged, but disappeared as well. Morgen goes the other way, and adds in the defendants’ two lawyers — William Kunstler and Leonard Weinglass — to make it the Chicago 10. Kunstler and Weinglass were both found in contempt of court by Judge Julius Hoffman and sentenced to hard time — Kunstler to four years. But not a word of any of this from critic LaSalle. Instead, he complains that all those anti-war protesters, hippies, yippies and assorted angry young people who went to Chicago “ended up aiding the campaign of Richard Nixon, not unlike the Naderites who helped elect George W. Bush a generation later.” As if Hubert Humphrey, the “happy warrior” stand-in for LBJ’s imperial bravado, would have ended the war. I guess we should have all shut up and worshiped at the Democrat’s feet while being drafted off to the jungles of Vietnam. In any event, Mr. LaSalle, it was actually the renegade Supremo Court that selected George W.
LaSalle claims to have trouble sorting out “the meaning of these events” and who the real “good guys” are. Indeed he does, preferring instead to wring his hands over the film’s use of “undigested” footage from the streets, the use of “modern pop music,” and Allen Ginsberg “intoning ‘Om’ into the microphone” during a showdown with the cops. In the middle of the movie, Abbie, asked about the trial, says it’s cool, he has a good seat. Mr. LaSalle is still sitting in his seat, forty years later, hat in hand, trying to figure out who the “good guys” are.